Did you know that well over 198 million Internet users around the world have installed ad blockers? And the number of ad block users only continues to grow every year. Advertising simply isn’t what it used to be for online businesses that relied upon ads as a steady source of income. Finding new ways to get regular revenue through your website can seem daunting, but a not-so-new way to monetize content is taking the Internet by storm—certain industries in particular. Many businesses have found that using a paywall is exactly what they need to proactively engage their audience while reliably bringing in revenue. In addition to this, using paywall solutions actually raises the value of your content in the eyes of your audience by creating a community of ultra-loyal customers who love the prestige of receiving your inside scoop and exclusive content. So does it seem to be perfect for your business? Here’s one of the simplest ways to understand ‘paywall’: it’s a plugin (block of code) installed on your website that prompts readers to purchase a digital content subscription to access your exclusive content. One of the most popular paywall strategies is the metered paywall—where websites offer a certain amount of free content to the visitor (e.g., five articles per month). When readers want more, they are prompted to subscribe for a monthly or yearly fee as per their use and requirement. The benefits of employing the metered paywall are many and well worth the time it takes to find a good WordPress paywall plugin for your site. When you draw readers in by offering that awesome, free content—showing them you’re a reliable expert in your field—they’ll be hooked. When they discover you offer exclusive resources, if you’ve prepared them properly, they should be ready (and eager) to become a paid subscriber. When you’ve built up your expertise in your niche and become a recognized authority to your audience, a certain percentage of your most loyal clients will be delighted to pay a small fee to join the special “in-crowd” and share in the extra value newly available to them. The rest of your audience will be content to continue utilizing and sharing your free content. In the meantime, congratulations! You’ve just converted some of your audience into dedicated fans—unarguably a key element in the growth of any successful business. What your audience is most interested in and willing to pay for? Do a little research on your audience to find out what it will take to convert your readers into loyal clients. 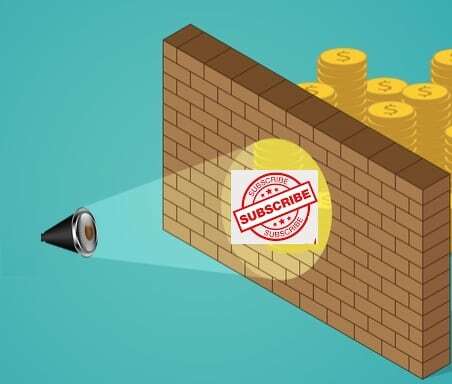 If your business has a very special niche, is a recognized authority in the industry (even if you’re the expert to only a few thousand dedicated subscribers), and/or you have unique content that is difficult to find for free elsewhere on the Internet, using a paywall may well be the perfect content monetization platform for you.